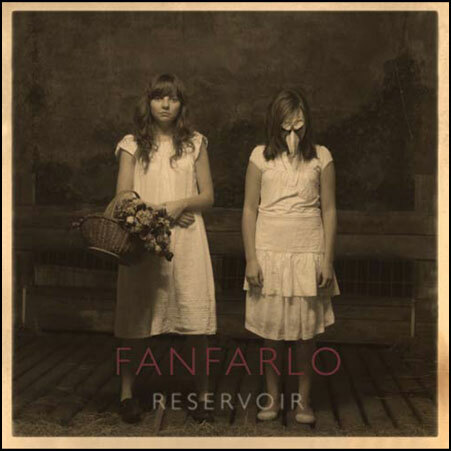 Fanfarlo‘s amazing new album Reservoir is currently available for download (with 4 bonus tracks) at fanfarlo.com for only $1 (but only until July 4). I recently got a copy of Reservoir and I’ve been listening to it constantly ever since, if you’re a fan of Arcade Fire, Beirut, CYHSY or Los Campesinos! then Fanfarlo may just be the ticket for you. Sigur Rós are big fans too, in fact, the album cover photo was taken by Sigur Rós member Jónsi’s sister Lilja Birgisdottir and it features his youngest sister Rósa and his cousin Disa standing side by side. One last detail for the trainspotters out there, Reservoir was recorded and produced in Connecticut by Peter Katis and apparently Jónsi liked it so much that he is currently recording his own solo album (not Riceboy Sleeps which is due out on July 20 on emi, but rather another solo album with Nico Muhly) with Mr. Katis as well. Fanfarlo recently recorded some videos for the UK’s Bandstand Busking, you can find those videos + their upcoming tour dates after the jump. PS NPR’s Bob Boilen claims this album is being released domestically in June, but I haven’t been able to find any further information about a label or a proposed release date. I couldn’t agree more, it is a great record. I wasn’t joking about listening to it constantly, and in fact, I got myself another copy just for the 4 extra tracks.